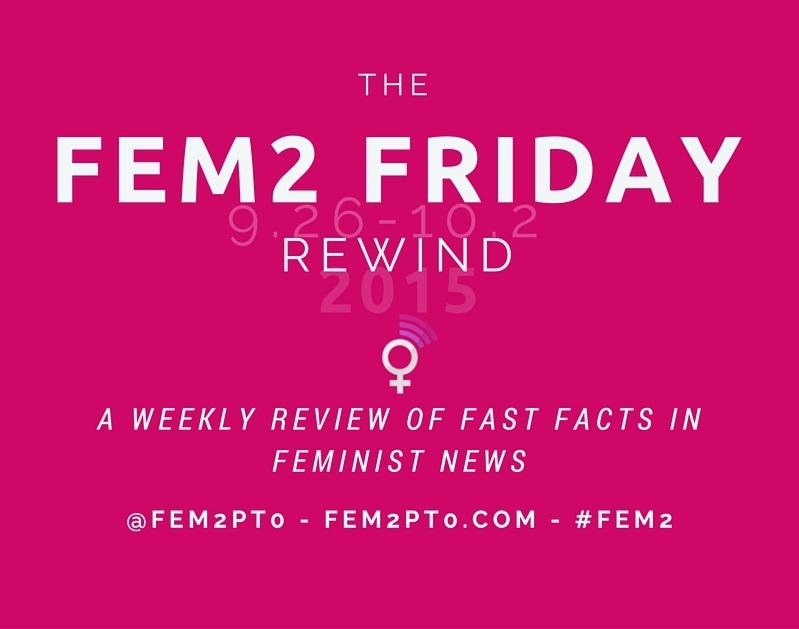 Welcome to the Fem2 Friday Rewind – your source for fast facts in feminist news – for Saturday, September 26 through Friday October 2, 2015. CALLING OUT THE CALL-OUTS: 77% of women under 40 in the US have been followed by a man on the street. 50% of them have been groped or assaulted. We need to take street harassment seriously as a society in the US and worldwide. This is a form of gender-based violence that should not be tolerated. Studies have shown that “body surveillance” and “unwanted sexual advances” over time have a high correlation to “insidious trauma”, leading to negative health outcomes. Also, women who feel objectified may be more likely to become victims of sexual assault. PP PRESIDENT vs THE GOP: On Tuesday, Cecile Richards, president of Planned Parenthood, testified in Congress following the accusations against the organization. PINKOUT SHOUTOUT: Coinciding with the hearing was National Pink Out Day, a rally that took place nationwide in support of Planned Parenthood’s work. People “#PinkedOut” at almost 300 rallies across the US, at which sexual education workshops and free STD screenings were offered. TWEETED DEATH THREATS ARE STILL DEATH THREATS: The founder of the #ShoutYourAbortion, Amelia Bonow, has been driven into hiding following death threats she’s received after declaring her gratitude online for her ability to access and have an abortion. “This is what it looks like when people decide to challenge an oppressive narrative by raising their own voices and choosing to accept a new level of personal vulnerability as a sacrifice,” Bonow said. That sacrifice is unfortunately relentless, violent messages and threats, resulting in the inability to feel safe in one’s own home. Despite all the current media play (and ample support from progressive and feminist communities) the stigma surrounding the issue keeps many women quiet about their personal abortion needs and use. THE SOCIAL MEDIA ‘BATTLEFIELD’: Some women’s jobs require them to speak out. Women in historically male-dominated professions, such as sports correspondents, are also often victims of online trolling. Sports Illustrated‘s Julie DiCaro wrote on her experiences covering the sports industry and the vile online harassment she and many her female peers have experienced online. Her report reveals the passing of Title IX only went so far to protect women’s rights to access the athletic community. THE CORPORATE WORLD ISN’T WORKING FOR WOMEN: A new study of women in corporate America revealed that women continue to see an uneven playing field in a workplace that is not inclusive. Part of that means acknowledging the importance of both work and family life. Interestingly, parents of both genders are more likely than childless adults to say they want to be promoted and become a top executive, however 90% of men and women believe taking extended leave for new parenting will hurt their careers. Mandating leaves would ensure that employers could not pressure new parents, intentionally or not, to skip or shorten their time off after welcoming a new child into the family. GRANTED GENIUSES: You should know about this year’s women recipients of the MacArthur Genius grant. Each grantee, chosen for their innovative, do-good-for-the-world activities, was awarded an annual $625,000 fellowship to help them continue their work. Get inspired by all of the amazing MacArthur Genius Grant Winners here. And that wraps the rewind for this week. PS For a little progressive mirth to start off you weekend, watch this week’s “A Closer Look” from Late Night with Seth Myers as he recaps the Planned Parenthood Congressional hearing.